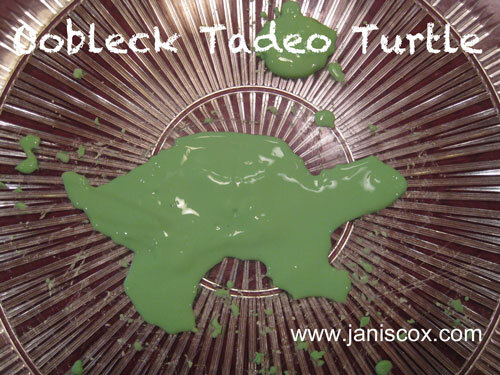 Creative Saturdays - Oobleck Tadeo Turtle. When my children were little we loved the book called Bartholomew and the Oobleck by Dr. Seuss. 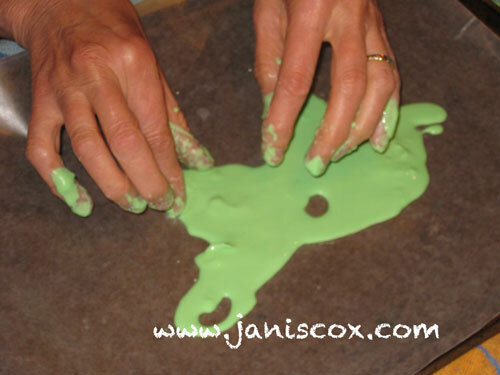 When I saw a sensory play called Oobleck I was hooked. 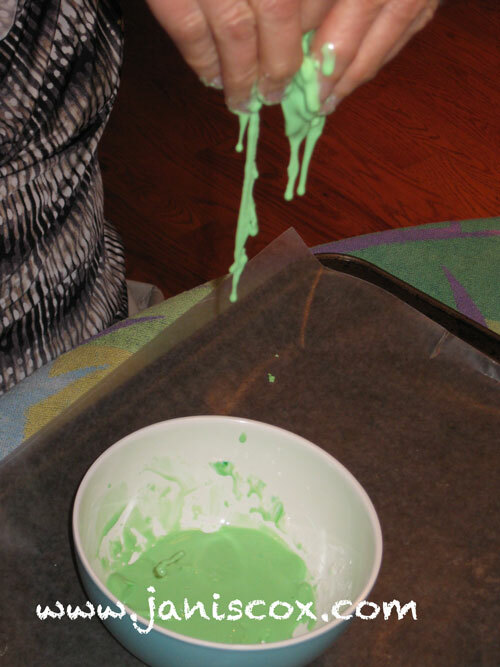 I couldn’t resist trying the recipe for Oobleck while I visited my daughter. While she cleaned up the kitchen I played with Oobleck. What a great sensory play. Here are great instructions from Scientific American and from Dr. Seuss Instructables. This is so simple as all you need is cornstarch and water. Yup – just cornstarch and water. I put some cornstarch in a bowl. I added a little water and started to stir. It feels clumpy to start with but soon turns to syrup. The more water – the more syrupy. And sometimes it feels hard – sometimes runny. You can tap it, you can grab it but then it turns runny again. Tonight I decided to add food colouring. Watching it swirl captivated me. Then I tried making a Tadeo Turtle on waxed paper. Don’t do this as the waxed paper rips. So I transferred the Oobleck to a plate. It is easy to move as it becomes a solid for a little while. Oobleck a liquid or a solid? 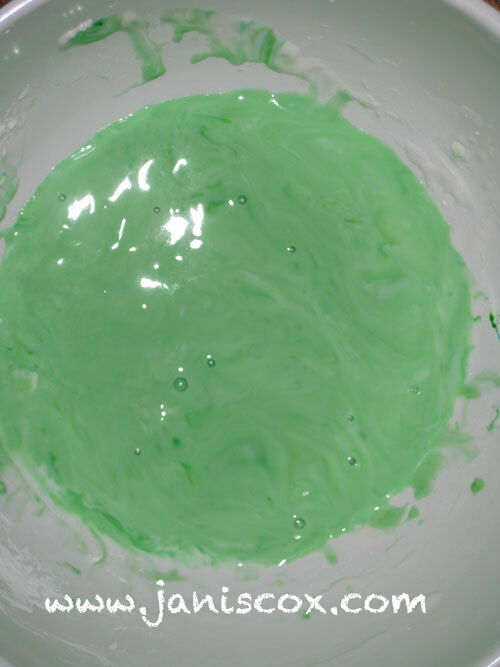 As I manipulated the Oobleck it would find its own spot. I learned to take some out and put it other places as I created Tadeo Turtle. Tadeo turtle is almost finished. Here is the finished Tadeo Turtle using oobleck. Surprise. I went back to check on Oobleck Tadeo Turtle and he had hardened. So I was able to use a toothpick and add details. I think you could do this on a board, then when it was fully hardened you could podgy it to keep. You could add colour too. 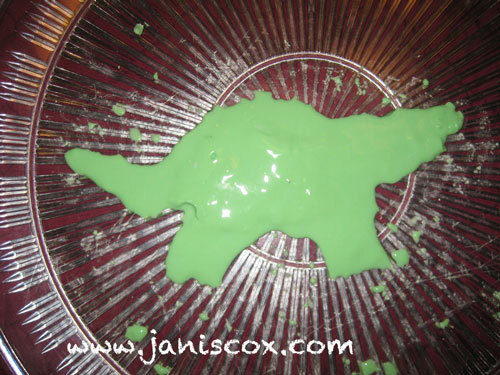 My husband says he wants the plate back – so my Oobleck Tadeo will have to be demolished. 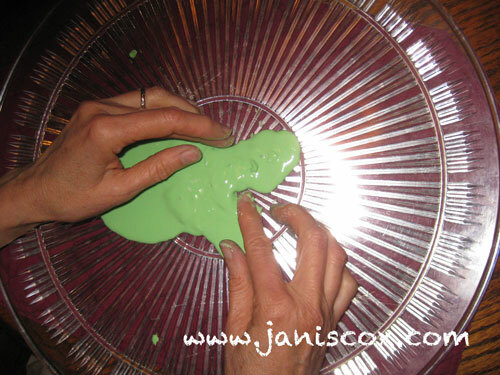 I had a great time with Oobleck and I am sure your children will too. 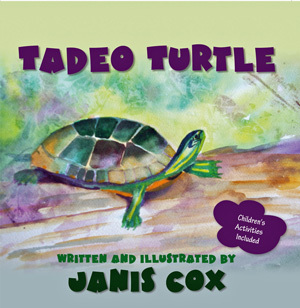 Please check out more about my book Tadeo Turtle on Tadeo’s Page. You will find more activities at the back of my book. And a 24 page curriculum is available if you ask. 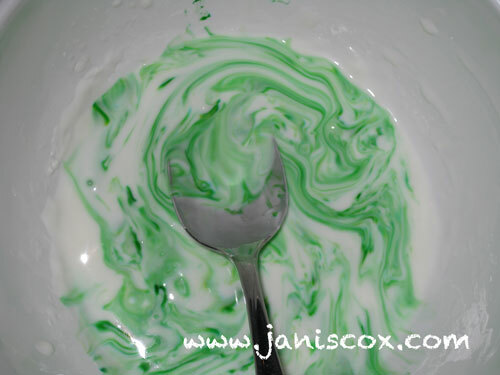 This entry was posted in Creative Saturdays and tagged cornstarch, Crafts, creativie, food colouring, Janis Cox, Obleck, sensory play on May 31, 2013 by JanisCox. Oh, how neat!! We didn’t let it harden when we made it, but I love that you can. Thank you for sharing on Sharing Saturday!! Hey there! Thanks so much for stopping by and linking up your cute crafty creations! Stop by again next week and link up another awesome project!